The Doves Press of London, England, founded by T.J. Cobden-Sanderson produced some beautiful books using a beautiful typeface, commonly called the Doves Type. Around 1900 Emery Walker joined the press as a partner. Over the next decade, there was a falling out between the two partners. A dispute developed in the ownership of the type. Cobden-Sanderson wanted to keep the typeface away from commercial use. In On August 31, 2016, Cobden-Sanderson decided to take matters into his own hands and over a period of over 4 months and 170 trips, dumped 2600 pounds type off the Hammersmith Bridge and into the Thames River. In 2013 designer Robert Green produced a polished digital version of the Doves Type. Aroused by the idea that the type might be still sitting on the muddy bottom of the river he undertook a search, eventually coming up with 150 pieces of the type. We bought a copy of the digital type which is quite a lovely face. 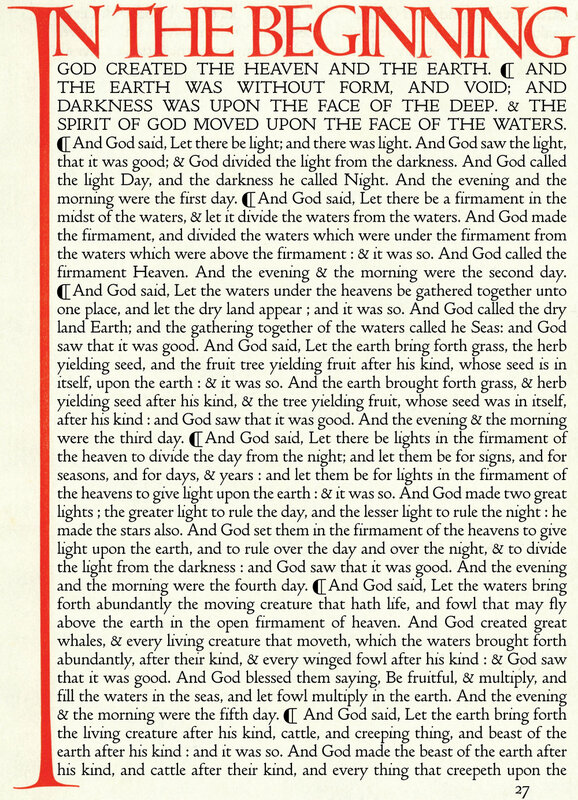 Doves Press produced all of their books with the single size of the single font and the composition for Genesis 1:1 is stunning. Two elements stand out, and you need to keep in mind that this is set in metal type (approximately 16 point). Below is the digital version of Dove's type. Once we had the digital version, we thought it would be interested to see how the digital type matches up to the metal version without inducing any adjustments. The image below was carefully centered along with very accurate line spacing to see how it came out naturally. There has been no adjustment to the tracking or letter spacing. In the image below the original is in black and the digital is in blue. It is essential to keep in mind that we don't know what effort was put into the metal composition. The digital spacing might also be improved from the commercial version we purchased. You can see many areas where the spacing is reasonably similar, and in other areas, there are very quick digressions. And then the image immediately below is the digital text added to the red initial to see if you would notice things like rivers, wide / tight word spacing, etc. Below it is the original page so you can look back and forth more easily. ⬆ Digital version of the Doves type. ⬆ Original letterpress version of the Doves type. We see several diagonal rivers in the digital version along with several instances where the reverse shows up when letters like "g" and capitals come into close juxtaposition across multiple lines. The word spacing seems more noticeable in the digital version giving the overall type a bit of spotiness (visual texture) for lack of a better typographic term. The original at the bottom seems a bit heavier. I'm not sure if it is ink gain from the original printing, my scan of the original type, or that the digital type is just slightly lighter. We are currently trying to figure out how the word spacing was manipulated to achieve such a beautiful page. Anyway, it was interested to experiment with this. Another thing you might notice on the Doves page is the space in front of semicolons and colons. We tend to do most anytime they occur because of Doves compositional styles.